Marvel Two-in-One #66: A Congress of Crowns! Ben, Triton, and Stingray all meet up with Dr. Croft at the PogoPlane. Ben recaps the events of the last issue, and Triton takes Dr. Croft off to the Great Refuge to be looked at by the Inhumans. Stingray and Ben head back for the F.F. headquarters in the PogoPlane. Ben calls ahead to see if Reed can track the missing Serpent Crown, but the other members of the Fantastic Four are all busy, and Agatha Harkness answers the phone. Ben fills her in, and she becomes very alarmed and goes to contact some help. She mentally contacts the Scarlet Witch, who is able to, by virtue of her prior contact with the Crown, pinpoint it as being in Washington, D.C. Agatha contacts Ben and Stingray in her own fashion, and realyes this information. Pg 17, panel 4. As Ben is mobbed by a half-dozen simulacra of old Crown wearers, he grabs one by a foot and swings him at the others: "Gee, I love bein' the center of attention and all-- but ya gotta excuse me 'cause -- It's Clobberin' Time!" This story is a great example of what made Gruenwald and Macchio (the Two-in-One Twins)'s run as writers of this series so great. It draws on a large and diverse bits of Marvel history to fashion a story that you don't have to know the backstory to follow, but which makes it only that much more fulfilling if you do. From Hydrobase and the Hydro-Men to the Inhumans, from the Serpent Squads to Roxxon, from the abandoned Serpent Crown from the Squadron Supreme world to the lengthy history of the Serpent Crown(s)- they all add to the story without overwhelming the story. Though there may be better individual stories in MTIO, I'd rate this three-parter as the best overall story. After a brief appearance in the first page or two of the next issue, the next appearance of the Serpent Crown is two years later in Marvel Team-Up Annual 5. That story really feels more like an MTIO story- it takes place at Project Pegasus and features (as well as Spidey, of course) Ben and Quasar, who felt like an MTIO supporting character by now, plus the Scarlet Witch and Dr. Strange. Agatha Harkness was Franklin Richard's former nanny, and is a very powerful witch. Original art from your editor's collection. Issue/page 66.6. I really find this one very creepy cool. 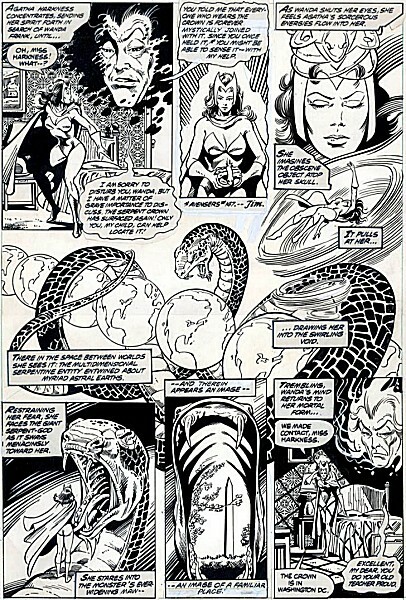 Much as I'd love a page from this trilogy with the Serpent Squad, I just love the whole look of this page, from Wanda standing on the serpent's chest the the Washington Monument in its mouth to the whole looping curve design - one beautiful page, to my mind.